Proud and supportive member of Delaware Taxidermists Association, United Taxidermist Association, and National Taxidermists Association. Taxidermy.Net was created by Ken Edwards, and is sponsored by his company, WASCO. It is the internet Masterpiece of Taxidermy Websites that provides a gathering point for ALL members of the taxidermy community. A special public THANK YOU is extended to Mr. Edwards, and WASCO, for their generosity, and contributions in promoting modern taxidermy, and the taxidermy industry. The Good Stuff Taxidermy Studio serves not only the state of Delaware, but also the neighboring states of Maryland, New Jersey, Virginia, Pennsylvania, and beyond! 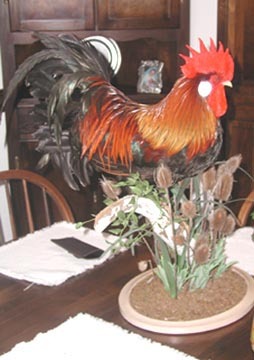 Delaware taxidermist George Roof offers full services in taxidermy. The most popular, but not in any particular order being fish mounts, waterfowl, wild turkey and upland game bird taxidermy, skull cleaning and rug making from your trophy, African safaris, bear and all the various furbearers, exotics, wild boar, and pronghorn antelope. Shoulder mount and lifesize mount taxidermy services for antlered big game include whitetail deer, mule deer, axis deer, fallow deer, sika deer, moose, elk, and caribou. Of special note, pedestal bases, taxidermy habitat bases, or wall hung habitat displays are custom made to fit your individual need or desire.